If you are thinking of starting a heritage album scrapbook, the first step is to organize your photos. I’ve talked a little bit before about knowing which photos to keep, and which ones to discard. In this article, I’d like to discuss a little about how to organize your photos that you’ve decided to keep so that scrapbooking can be a lot faster, and easier. The most obvious choice is to scrapbook by year, or chronologically. If you choose to make this your method of organization, then you simply want to get busy figuring out when photos were taken. With old photos, this may be difficult to do when you may not have a lot of information. However, we will assume that if you have chosen this method, then you have a general idea when most photos were taken. 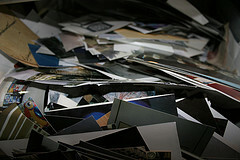 A simple way to get started organizing them is to figure out roughly how many photos you have for each year. If there are just a few, then an accordion folder or something similar that is archival safe and acid free might be the best way to start organizing them. However, I would not leave photos in this folder for long. If photos are stacked for too long, they can start to stick together and get ruined. Only use this method if you know you will start scrapbooking right away. Otherwise, leave old photos in photo boxes until you are ready to start scrapbooking them. The difficulty with scrapbooking chronologically can be that you don’t know when photos were taken. If this is the case, then you might decide to scrapbook by family instead. This would be a great way to create albums like this that are all about one specific nuclear family. The only problem you might run into with this scenario is that you don’t know quite who a person is, or which family they belong to. Or, perhaps there are multiple families in one picture. If this is the case, then simply make a copy of the picture so that every family pictured can have that same photo in their album. You could also create albums centered around one specific family member. You can really only do this if you have a large amount of photos for one particular member of your family. If you have less photos, then you might want to scrapbook by decade. Each album you create would include a 10 year period of time, and anything and everything that happened during that 10 years. This would be a fun album to do because you could also highlight what was happening in history during that same time period. Whatever you decide to do, keep your ultimate goal in mind. When you first start organizing photos, it can be overwhelming, but if you think about what your end result should be, then it can make things a whole lot easier. Just remember to always store photos in something that is acid free.